Microsoft today unveiled an all-new "Surface Laptop," a student- and teacher-focused Windows 10 S, new features for Minecraft: Education Edition, a new Surface Arc Mouse, and more at an education-focused event in New York. The hardware reveal of the Surface Laptop marks the first major computer launch for the company since last year's debut of the Surface Book and Surface Studio, the former of which saw huge sales numbers thanks to churn from the "disappointment" of the 2016 MacBook Pro with Touch Bar, according to Microsoft. When compared to the Surface Book's unique reversible hinge, the just-announced Surface Laptop is more traditionally built with a clamshell design and four color options: burgundy, platinum, cobalt blue, and graphite gold. 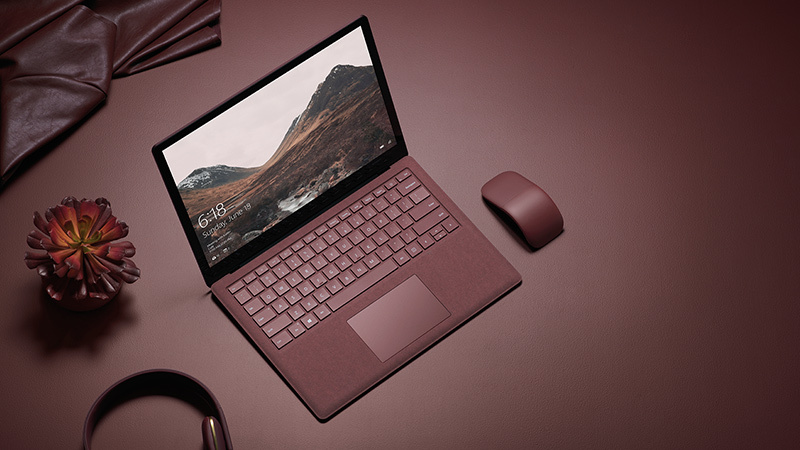 Microsoft is aiming the Surface Laptop at the grade school and college education market, but the laptop will still be purchasable by all users on Microsoft's store, starting at $999 for the Intel Core i5 version with 4GB RAM and 128GB of SSD storage. 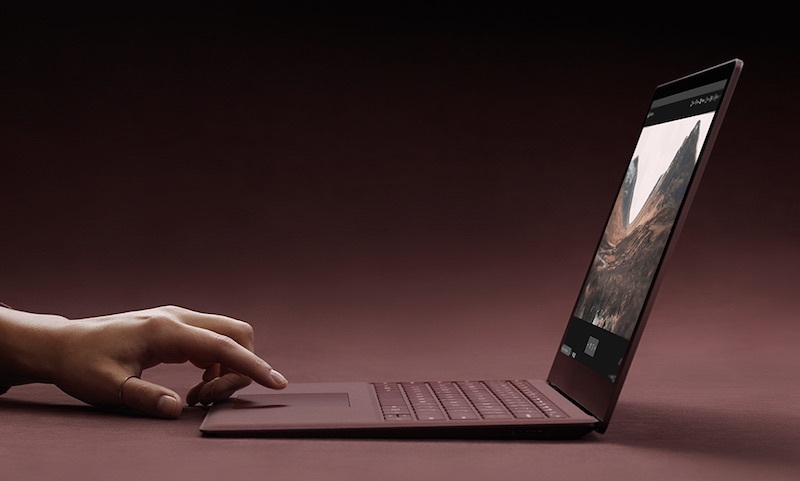 In terms of specs, the Surface Laptop includes a PixelSense Display touchscreen with a resolution of 2256 x 1504 that measures 13.5 inches on the diagonal, made with edge-to-edge Corning Gorilla Glass 3. USB-C is not found on the Surface Laptop, but ports otherwise included are: USB, an SD card slot, mini DisplayPort, and a traditional charging port. The laptop will have a battery life that lasts for around 14.5 hours. The Surface Laptop weighs 2.76 lbs and is 14.47mm at its thickest point, which Microsoft said is unmatched by any of its rivals' laptops. In comparison, the 13-inch MacBook Pro with Touch Bar weighs 3 lbs and is 14.9mm thick. The keyboard section of the Surface Laptop is covered in the same Alcantara material used by the Surface Pro 4 keyboard, and resists spills and is easy to clean, according to the company. We built Surface Laptop to do two things: refresh the classic laptop form factor that our customers, especially college students, have been asking for; and make a Surface that works seamlessly to showcase the best of Windows 10 S.
The result is the most personal and balanced Surface we’ve ever made. This Surface perfectly blends fabric and function, power and portability, beauty and performance. It does all of this without compromising on the things we know are important to higher education students: battery life, display quality, storage, and portability. Microsoft's new Windows 10 S operating system comes installed on the computer and is said to provide "superior performance" on laptops at the lower end of the hardware spectrum. Windows 10 S is a walled garden OS, allowing only approved applications from the Windows Store to be downloaded on the system while also cutting down on some Windows 10 features to provide streamlined security and performance. Microsoft said that these features are expected to come in handy for teachers in classrooms who need regulations on the computers and applications with which their students interact. Windows 10 S will be making it onto a variety of hardware devices, not just the Surface Laptop, including laptops from HP, Dell and Acer. These devices will come in much cheaper than Microsoft's first-party laptop as well, expected to range from $189 to $300. Microsoft's EDU event also saw the announcement of new features for Minecraft: Education Edition, which will be gaining a new "Code Builder" tool that will allow students to connect to popular learn-to-code platforms to build impressive structures within the game. During the presentation, Microsoft gave a few examples of projects that students have already begun working on using Code Builder in Minecraft, including a Liberal Arts teacher tasking her class with reconstructing Shakespeare's Globe Theater. Other details of the event include Microsoft Teams, which will let students and teachers collaborate on projects in a chat room, new 3D and mixed reality initiatives, and updated device management software for teachers. A new $79.99 Surface Arc Mouse was also announced today, and is aimed to be a "travel companion" for any Surface device, including the Surface Laptop. The mouse supports Bluetooth 4.0, houses two buttons, and is designed with a travel-friendly, bendable tail. Pre-orders for the Surface Laptop will begin today, and the device is said to begin shipping on June 15. Configurations on the laptop will go all the way up to an i7 processor with 16GB RAM and 512GB of SSD storage. For a recap of Microsoft's EDU event, check out a highlight video that the company posted to its YouTube channel, as well as a design-focused overview of how Microsoft engineers crafted the Surface Laptop. Touchscreen on a laptop? No thanks. This particular product may not appeal to me, however there is absolutely no denying that Microsoft has been killing it over the last few years. Props to them! Edit: Surprised they're going for this approach again with 10 S, considering how hard Windows RT flopped. No excuse for 4GB DRAM in 2017. Should be 8GB on the base model. Wait, it doesn't even have full Windows 10? If I'm already spending $1000 why not spend $100 more and then get a refurbished 12 inch 2016 MacBook? You get twice the RAM and twice the storage, plus a full OS (that id prefer to windows) that also can run full windows if you so desire. Far superior display, too. So it comes with a locked-down version of Windows and only has one USB-A port and a mini Displayport... port. And 4GB of RAM in the base model. And people thought the MacBook had crap connectivity. Is Apple ever going to wake up? Why is Tim Cook still CEO? It's windows, but can't game. That's like buying a car with no headlights. Pointless. Cant deny that MS is doing more right than Apple in the last couple of years. No thanks, it runs on Windows.